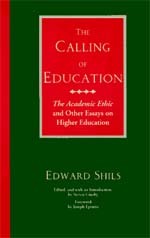 Buy The Calling of Education: "The Academic Ethic" And Other Essays On Higher Education 2nd ed. by Edward Shils, Steven Grosby (ISBN: 9780226753393) from Amazon's Book Store. Everyday low prices and free delivery on eligible orders. Throughout his long and prolific career, Edward Shils brought an extraordinary knowledge of academic institutions to discussions about higher education. The Calling of Education features Shils's most illuminating and incisive writing on this topic from the last twenty-five years of his life. The first essay, "The Academic Ethic,"
The calling of education : the academic ethic and other essays on higher education. Responsibility: Edward Shils ; edited and with an introduction by Steven Grosby ; foreword by Joseph Epstein. Imprint: Chicago : University of Chicago Press, c1997. Physical description: xiv, 294 p. ; 24 cm. Earwater,J. (1992) Helping and Supporting Students, Buckingham:Society for Research into Higher Education/Open University Press. Fengyan, W. (2004) Confucian thinking in ... Shils, E. (1997) The Calling of Education: The Academic Ethic and Other Essays on Higher Education. Chicago: University of Chicago Press.